The Longridge Challenger Cadet junior package is designed for children aged 12-14. 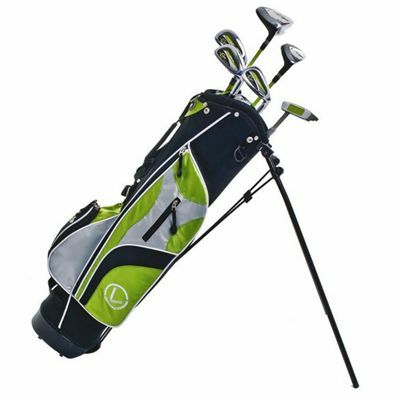 The set consists of 6 clubs: driver, hybrid, 7, 9 and PW irons, putter, and a stand bag. The brightly coloured bag and advanced technology make the set attractive, fun and easy to use. The clubs feature graphite shafts. The club head and shaft are lightweight and created to aid the typical swing speed of a junior golfer. The bag is green in colour to match the set and features a dual padded strap and several storage pockets. for submitting product information about Longridge Challenger Cadet Junior Package Age 12+ We aim to answer all questions within 2-3 days. for submitting product information about Longridge Challenger Cadet Junior Package Age 12+. We aim to answer all questions within 2-3 days. If you provided your name and email address, we will email you as soon as the answer is published. for submitting product review about Longridge Challenger Cadet Junior Package Age 12+.